Researchers at Cornell University have successfully fabricated a working loudspeaker using a 3D printer. Their work represents one of the first times a complete electronics device has been printed from scratch to a working product. As its name suggests, a 3D printer is capable of printing in a third dimension, layering upwards from a base material in additional to the two-dimensional flat printing we are all used to. Rather than ink, it uses materials like plastic. Developers believe it could one day enable people to print small products, components, and devices in their home. The speaker’s plastic body, conductive coil, and magnet were all printed using a “Fab@Homes” printer at the university. and the speaker was almost ready for use as soon as printing was finished, the university said. The Fab@Home is a research printer that was developed by two Cornell students to help researchers experiment with 3D printing. One of the developers, Apoorva Kiran, a graduate student in mechanical engineering, worked with fellow student Robert MacCurdy on the speaker. The ability to print components like speakers using a home printer is one of the promises of future 3D printing technology, but it’s not here yet. Conventional printers are unsuitable for 3D printing and many 3D printers that are just beginning to come to market don’t have the capability to print with different materials. Fabricating a single device also requires the selection of materials that work well together, according to Cornell. Conductive coil, copper, and plastic coming out of the same printer require different temperatures and curing times, it said. 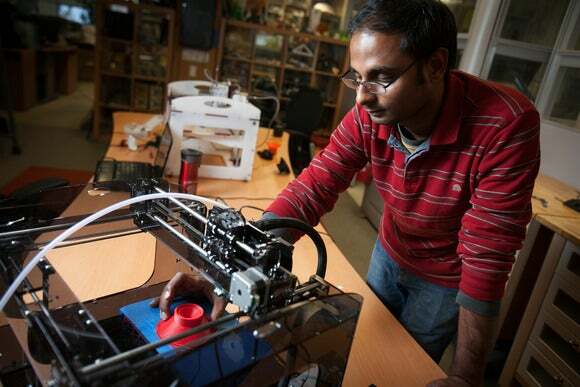 Research into 3D printing is still in its early stages. A recent report by Gartner predicted that the market for sub-$100,000 3D printers will grow 49 percent this year to 56,507 units on the back of rapid increases in quality. For 2014, Gartner expects the market will jump by around 75 percent to just over 98,000 units and that shipments will almost double again in 2015.